By ShowChrome Accessories. Everyone sets sound levels differently for their own desired listening levels. Big Bike Parts® is sensitive to this need for individual sound volume control while riding, as both rider and passenger most often would prefer to turn it up or down. Through their Audio Department, Big Bike Parts® has been offering a proven solution for the past 7 years with their 5 Pin Din Volume Control. 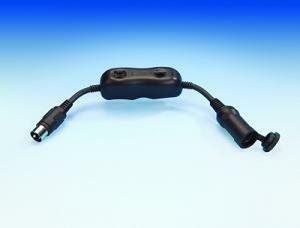 This Plug ‘N Go module simply plugs in between your headset and your motorcycle 5 pin din connector. This easy to install jack module immediately gives the user control of both left and right speakers individually as well as microphone volume control, all the way to off. This 3 function volume control is the ideal way to eliminate listening compromises.